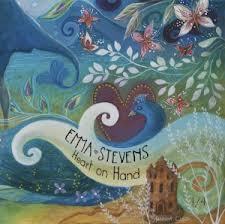 HEART ON HAND is the initial instalment of a four part EP release designed to launch the solo career of UK singer-songwriter, and multi-instrumentalist, Emma Stevens. It was released last year but really gained momentum when Emma supported Jenn Bostic on her recent tour and thus coming across my attention. The format of this release has the advantage of ensuring each of the four tracks are intensely listened to as the next stage is eagerly awaited and on the evidence of the songs on HEART ON HAND, this is something to look forward to. The project was launched on the back of a family bereavement and Emma’s late mother created the artwork for each EP which will ultimately form a complete picture. The second EP is due out shortly but the quality and depth of the song writing on HEART ON HAND has set the bar high for Emma. 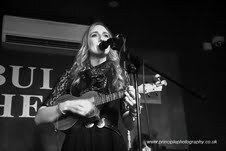 All four songs on this convivial release are well constructed melodies that demonstrate substance and an ability to balance the contrasting emotions of serious and lighter moments.As well as her songwriting expertise, the four tracks highlight Emma's adept musical ability on guitar, piano, mandolin, banjo and ukulele. ‘A Place Called You’ is definitely from the feel good school of song writing and this jovial tune has all the hallmarks of a song designed for radio play with added whistles and clapping. It gives the EP a bright and breezy opening, although it doesn’t necessarily set the tone for the entire record. The second track ‘This is For You’ floats around your mind in a more satisfying way than the previous tune with Emma’s vocals and subtle acoustic strumming having an increased lasting impact. The emotional message of the song derives straight from the heart. By far the best song on this inaugural collection is ‘How to Write a Love Song’ where Emma sets out the essential ingredient required for creating such as song – pain. This tune has all the hallmark of Taylor Swift at her best, which for me was on her first album. The heartfelt emotions are expressed explicitly in a mature manner which leads to a rewarded listen. There is a little bit of a return to the pop infused style of the opening number in the final track ‘Simple Things’ which, as it says in the title, suggests we shouldn’t get too complicated with life and get back in touch with what matters most. The positive message is straightforward and will find its place in most people’s minds. Prior to this project, Emma has enjoyed success as a backing and session musician thus possessing the raw tools to make this solo career a success. More importantly she has the knack of creating a good melody and ensuring this is best showcased by minimal production. Overall a very positive set of tunes to lift your emotions and focus on what is really important. The next serving is highly anticipated.